1. The capability to recover from some disk-related errors automatically, which FAT32 cannot. 2. Improved support for larger hard disks. 3. Better security because you can use permissions and encryption to restrict access to specific files to approved users. 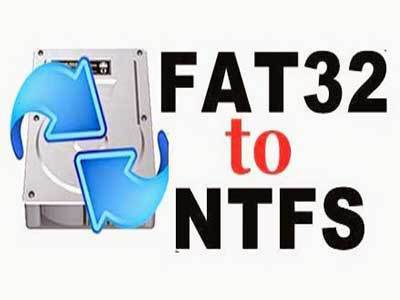 In this article, I will show you how to convert FAT32 to NTFS format without losing any data. 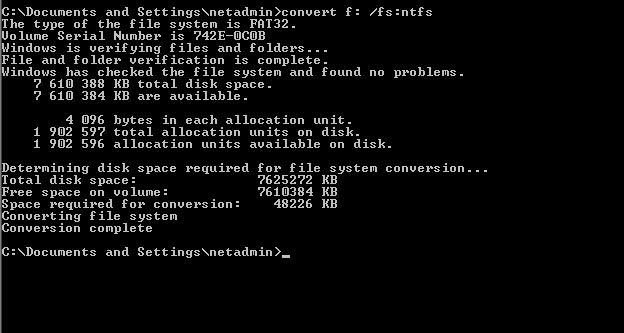 Conversion of Fat32 to NTFS can be done using command prompt without any data loss. Generally you have a pendrive or external hard disk having this kind of Fat32 system. FAT32 system does not support handling of larger files over 4GB. FAT32 file system has less stablility, security and more defragmentation time. But NTFS file system has more stability, security and less defragmentation time. Generally we use all removable media's in FAT32 file system only. We don't convert it into NTFS as we bother about data loss. But microsoft added capability to convert FAT32 to NTFS without any lossing any data or formatting the disk. This method is easier and doesn't require any additional tools and can be done using command prompt. 1) Open My computer and note the name and letter of the drive to convert. 2) Open run ( win + r ) and type cmd and hit enter. 2) Command prompt will open. 4) Type and execute "chkdsk F:/f" where F is the drive letter. This command checks and fix the drive errors. 5) Then type and execute "Convert F:/FS:NTFS". Command prompt will start the process and after the process is completed it will show the conversion is successful. 6) Later you can check the properties of the drive. Note: This method will convert form FAT32 to NTFS only. This doesn't work for NTFS to FAT32. You need to format the entire drive which will definitely cause data loss.